Can you give me some tips on organic flea and tick control for my dog? In the humidity and dampness of an Appalachian summer, nearly every pet owner has to deal with fleas. Ticks are another special treat for us here, and both deer and dog ticks are commonly found on household animals. In addition to being a nuisance, these pests can create other problems for your animals. For example, fleas can lead to internal parasites in dogs, deer ticks are vectors for Lyme’s Disease, and dog ticks carry Rocky Mountain spotted fever. While many chemical repellants and insecticides can be found on the market, your concern about the safety and efficacy of these chemicals is spot on. Common flea and tick control methods for dogs and cats, including tablets, flea collars, and liquid pour on treatments contain organophosphates, neonicotinoids, and carbamanes. These chemicals are nervous system disruptors, and can also act as endocrine disruptors. Familiar products containing these chemicals include “Frontline”, “Advantage”, “Vectra” and “Capstar”. The toxicity of these compounds to invertebrates is undisputed. What is commonly misunderstood is their toxicity to humans, specifically children, and also to the very pets carrying them around. To top it off, neonicotinoids have recently come under fire for their involvement in the decline of bee populations worldwide. If you are using some of these products, or other insecticidal products like soaps or sprays, I’d encourage you to research what chemical compounds these products contain. You can simply Google the trade name of the product, and look on the packaging. The Natural Resources Defense Council (www.nrdc.org) has a GreenPaws product directory, which lists many common pest control products used on household animals, and gives a brief explanation of potential dangers as well as recommendations for less-toxic remedies. While the site is a helpful place for looking up the basic chemical components of your pest control products, I’d caution you when it comes to following NRDC’s recommendations for other treatments, as their warnings seem to reflect only what is toxic to humans and dogs or cats, while leaving out other critters (such as the bees, for example). After a little education about what is available and what you might already be using, it’s time to get started on your new flea and tick control regimen. The first thing to remember, as you begin to combat these pests naturally, is that you will never eradicate them. You’re goal is to manage their population so as not to wreak havoc on your household. You may not even realize that total eradication is impossible with chemical controls as well, as the life cycle of fleas, in particular, can allow a single generation to be present in your home and lawn for up to two years. Additionally, many chemical treatments only address fleas at the adult stage. 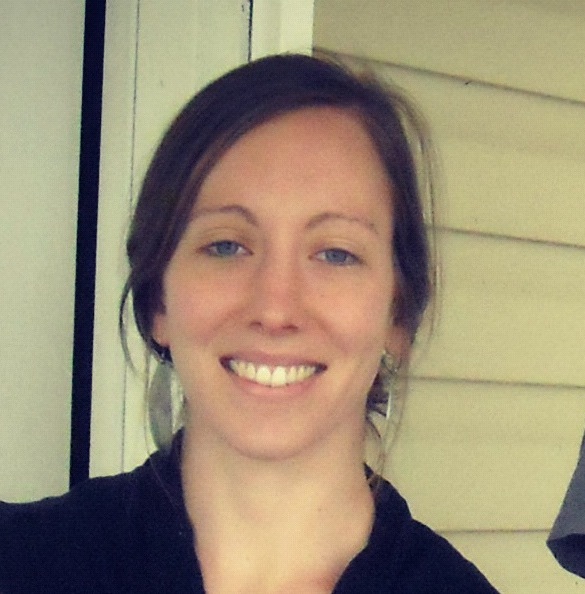 When Organic Growers School teaches about pest control in the veggie garden, we always encourage growers to educate themselves about the life cycle of the particular pest species, as this allows for more thorough and timely management of the population. Fleas, in particular, are better controlled if you consider the full life cycle, which includes four stages: egg, larva, pupa, and adult. Adult female fleas can lay over 400 eggs in their lifetime, and some sources say they can manage up to 1000, averaging as many as 25 eggs in one single day. Females require a food source in order to continue producing eggs, so preventing them from sucking on your dog at the adult stage is obviously ideal. Note, however, that both male and female adult fleas can survive for quite some time in between meals, and some sources say they can go for more than a week without blood and still survive. Eggs take from 2-21 days to hatch, and then the larvae persist for 9-200 days before spinning a cocoon. The cocooned pupae can hang out for as little as one week before emerging as adults, or, they can pupate for up to a year. Research shows that they will emerge in the presence of a host, so they simply bide their time until they “know” there is a mammal to jump on. If you consider all of these long cycles of life, it’s easy to see how you can have fleas in your home from just one generation for up to two whole years! Ticks also have a four-stage life cycle, from egg to larva to nymph to adult. The main difference between fleas and ticks in the ability to control them is that ticks are much more dependent on food at each life cycle, and they prefer to rotate host species. Thus, the likelihood that a tick will die before reaching the next stage of its life is much higher. 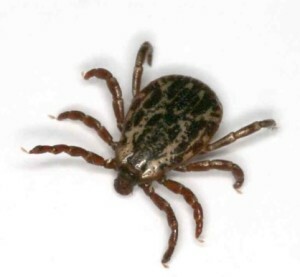 While it can take 3 years for a tick to complete its life cycle, they cannot persist inside your home if not attached to a host (you or your pet). Now that we know how these little suckers work, we’ll cover safe, natural ways to control them. Healthy diet: Your dog or cat needs balanced nutrition to maintain resilience against the many pests and diseases that pets confront. In particular, healthy skin will aid greatly in your pet’s susceptibility to fleas. If your dog’s skin is dry and scaly, the animal will scratch constantly, leading to open sores. As you can imagine, open sores are flea magnets, as the pests won’t have to work at all to get at your dog’s blood. Additions to your pet’s food that can aid in skin regeneration and health are omega 3 and 6 fatty acids from fish skins or fish oil, egg yolks, thiamine via nutritional yeast, and zinc. Clean & Dry Environment: Vacuuming your home, and washing your pet’s bedding weekly can greatly assist in flea and tick prevention. If your home is very humid, you can try using a dehumidifier to help dry the air. Fleas thrive in humid environments, and as mentioned earlier, can hang out in their various juvenile stages for more than a year. Once you’ve vacuumed, be sure to properly dispose of the vacuum bag or filter contents by sealing it up and throwing it away, or burning it. Otherwise, any eggs you’ve vacuumed will persist, and hatch inside your vacuum cleaner. Composting your filter contents may work, if you manage a very active and hot compost pile. Fleas cannot manage temperatures over 103F, so a consistently hot pile should succeed in killing them at all stages in their life cycle. Regular baths for your pet, as well as combing with a very fine-toothed flea comb will help you manage pest problems. Garlic is cited as an effective helper against insect pests in pets, although some owners and vets will caution against it. Some reading I did specifically mentioned that garlic could be toxic to dogs, while an equal number of articles claimed it is completely harmless. One woman claimed that her mother fed a clove of garlic to the family beagle every day. He lived to be 21 years old! 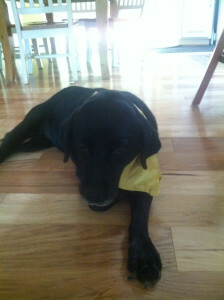 Buck’s bandanna holds a combo of essential oils. Lemon and other citrus oils have long been used to repel sucking insects. Some caution that your dog (and cats especially) may exhibit allergies to citrus oils, so you may want to introduce them in small quantities to make sure your friend can tolerate them. Some ideas include creating a lemon rinse for your pet by soaking halved lemons overnight in hot water, straining, and then rinsing your animal’s coat after bathing. Other people use essential oils of citronella and lemongrass on their pet’s collar or a handkerchief tied loosely around the animal’s neck. rosemary, and thyme. 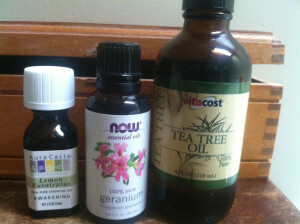 Geranium is particularly effective for ticks. If you can find rose geranium, that’s even better. Other sources cite bay oil, clove oil, cinnamon oil, tea tree oil, and eucalyptus oil for pest control, but some of these are not suggested for cats, so read about the oil you’re considering before getting started. Please note: some sources encourage the use of Neem oil in the control of insect pests. This is very effective, however, highly toxic to bees. Neem is a broad-spectrum insecticidal oil that can have damaging effects to species other than your pest. Use it sparingly and responsibly! Saltwater is helpful in repelling fleas and ticks, both. Animals that swim in the ocean have fewer problems with sucking insect pests. Some animal owners who don’t live near the ocean have suggested creating saltwater “dips” for their dogs. Cats, who don’t take to water too well, may be harder to treat with this method. Vinegar is a powerful deterrent. Create a rinse of one part apple cider vinegar to one part water and use it on your pet’s coat after bathing. You can also try adding a small amount of vinegar to your pet’s water dish. Diatomaceous Earth (DE) is the crushed up bodies of diatoms, a type of algae. Their bodies are mostly silica, and lead to abrasion and desiccation (drying out) of insect’s bodies. DE can be purchased as a food grade powder, and lightly dusted in hard-to-vacuum corners of your home. Use caution when applying DE, as it is a very fine particulate matter, and you don’t want to inhale it or get it in your eyes. Another caution regarding DE is that it is broad-spectrum, meaning it will affect even insects that you don’t want to deter. Enter again the honeybee. Consider the broad range of effects of DE before spreading it indiscriminately throughout your property. Err on the side of small amounts, on calm days, on the ground as opposed to flowering plants, and only in areas that are especially humid and wet. When buying for use in the home, pay careful attention to garden grade vs. food grade DE. 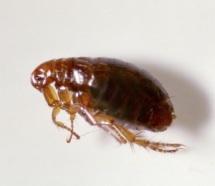 Homemade Traps for fleas can be a good way of controlling these pests inside the home. 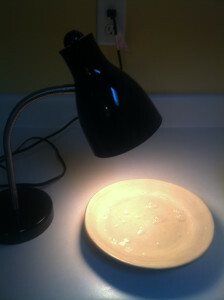 Simply set a small desk lamp about 6 inches above a shallow dish of lightly soapy water. You can use any non-detergent or castile soap, or you can add a dash of insecticidal soap. Adult fleas will be attracted to the warm light, and then fall into the soapy water and drown. You can dump the dead fleas and water down the toilet, and refresh your trap every other day or so. Tick Removal is the inevitable control method you will use against ticks on your dog or cat. Uses a cotton swab soaked in rubbing alcohol or soap and hold it on the attached tick for 30 seconds before pulling. This method helps you remove the entire tick. If you happen to pull the tick but accidentally leave the head attached, transmission of tick-borne illness is still a risk. Remember: prevention over treatment, and management over eradication. Good organic pest control is an on-going process. If you do it right, it will lead to a better quality of life for your pet overall. I hope this arsenal of natural pest-control tips will help!